On Sunday we were able to view a nearly total solar eclipse here in Uganda. The team at GSF received an email from an astronomy organization offering to give us free eclipse viewing glasses. 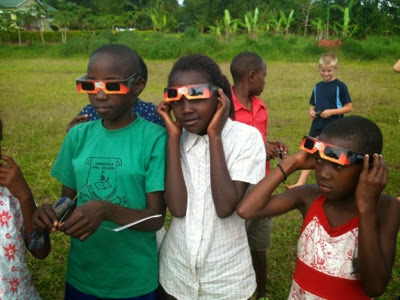 We got 400 pair of these glasses, and Claudia planned an event inviting children from the local villages to join the children here at GSF for the eclipse. Everyone met in the chapel for a time of worship, a lesson about the history of solar eclipses, a science lesson about what happens during an eclipse and a gospel presentation. David helped with some of the teaching and the visual aids. Then everyone walked out to the "football pitch" (aka soccer field), to receive their viewing glasses and watch the eclipse. It was great fun! Here are a few of the 300-400 kids who came wearing their glasses. Since an eclipse like this is such a unique event and will not occur again for another 18 years or so, we wanted to make the most of this opportunity. Today in school, we read Psalm 19. Then we asked our students to write or draw about this eclipse. I thought you might enjoy some of their work. Ezra, in Kindergarten, explained his picture below. "This is what I saw through those very powerful sunglasses when the eclipse was almost done. I drew this because God is high in the sky. 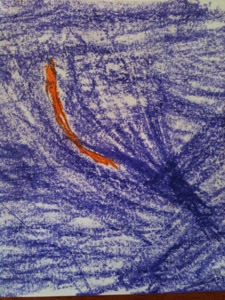 God made outer space, and that is another reason I drew this picture." "Whom shall I fear? For if the LORD my God wishes anything to happen to me, it will happen. The moon and stars are at his command, and everything beautiful is his." With words he spoke them to come. This splendor makes you sigh. You can find it on the grassy plain. God's glory sure is bright." "God made the heavens and the earth. He made every living thing. He made the sun that shines. He made the stars that light the night sky. He made the moon that reflects over the water. God made a solar eclipse when the sun and moon line up." And the water in the pool. You made the moon to move between us and sit. Saying night is coming soon. You alone are worthy to be praised." Here is the beginning of Psalm 19. This passage along with watching the eclipse was the inspiration for these poems, pictures and prose.